BERKELEY, CA – An experiment that began as a “fantasy pipe dream” just three years ago is now a reality. Researchers with the Lawrence Berkeley National Laboratory (Berkeley Lab) and the University of California at Berkeley, combining nanotechnology with biochemistry, have created unique synthetic membranes that, for the first time ever, enable them to directly control signaling activity in living T cells from the immune system. Already their experiments have yielded surprising results. Jay Groves, a Berkeley Lab/UC Berkeley chemist, led the development of synthetic membranes that can interact with living T cells to enable scientists to control critical signaling activity in the immune system. 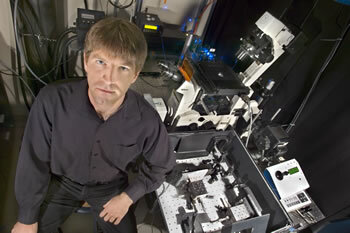 Groves is the principal co-author, along with Michael Dustin, a cellular immunologist at New York University (NYU), of a paper published in the November 18, 2005 issue of the journal Science, entitled: “Altered TCR Signaling from Geometrically Repatterned Immunological Synapses.” The lead author is Kaspar Mossman, a graduate student in Groves’ research group, and the second co-author is Gabriele Campi, a graduate student at NYU with Dustin. These fluorescently labeled electron micrographs show immunological synapses formed by T cell receptors (green) and adhesion molecules (red). 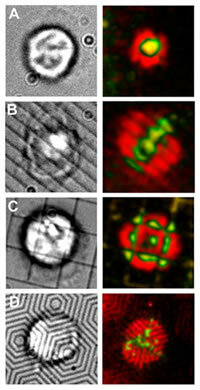 Image (A) shows the synapse in its natural bull’s eye shape; in image (B) chromium lines were used to pattern the synapse with parallel lines; (C) the synapse was patterned into a square grid; and (D), the synapse was patterned into concentric hexagons. The human immune system is a remarkable collaboration of different types of cells, working together to protect our bodies from bacterial, parasitic, fungal or viral infections, and against the growth of tumors. The process starts when “antigens,” special markers on the surface of a cell, identify another cell as “non-self,” and signal the cellular warriors of the immune system to kill the invader. Leading this attack will be the T cells, lymphocytes from the thymus. It is well established that the key to T cell activation is the molecular signal coming off antigen-presenting cell surfaces. This signal must be enhanced and sustained long enough for the T cells to commit to mounting an immune response, and then must be cut off in time to avoid antigen-induced cell suicide or “apoptosis” of the T cells. 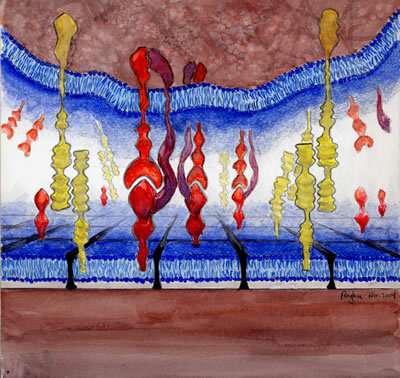 This watercolor painting by Raghuveer Parthasarathy, a member of Jay Groves research group, shows a hybrid interface between a living T cell and a synthetic membrane on a substrate that has been patterned with chromium lines. T cell receptors (TCRs) are communicating with their corresponding signaling ligands on the membrane. By controlling the spatial arrangements of the signaling ligands, scientists can control the T cell’s overall response. If scientists can learn more about the impact that spatial arrangement has on the immunological synapse and its signaling strength, the information could benefit the future development of drugs for treating autoimmune diseases. Such information should also help scientists better understand the chemical language by which cells communicate with one another. Groves said this new technique for spatial mutation studies should be applicable to many intercellular signaling systems. Already, he and his colleagues have begun applying it to study neuronal synapse formation, and cell signaling mechanisms in the development of cancer. They are also using it to look at the dynamic range of signaling over which T cell receptors can respond. The earliest indications that spatial positions could influence T cell signaling and that the synaptic pattern might actually help to extinguish the signal came from the work of Arup Chakraborty, a chemical engineering professor who, at the time, held a joint Berkeley Lab/UC Berkeley appointment and is now with MIT University. Chakraborty is a pioneer in the use of computer simulations, called “experiments in silico,” for studying important problems in cellular immunology. In 2003, his computational models indicated that the immunological synapse is responsible for intense but self-limited T cell signaling.